All Securall cabinets are built to the highest quality specifications. Whether you are storing dangerous flammable chemicals or you need a cabinet for heavy industrial tools, we have the perfect cabinet for your needs. If you have a special situation that requires a customized design, we will welcome the opportunity to work with you to provide a safe storage solution. All cabinets comply with current OSHA regulations and are designed in accordance with the standards of NFPA Code 30. Popular models are FM Approved. Securall Safety Cabinets have Structurally Reinforced 18-Gauge Double Wall All Welded Construction throughout. Securall cabinets have Double Wall Construction with 1 ½" Air Space throughout the cabinet design. Securall cabinets are built with an OSHA compliant leak proof sill 2" Deep to prevent leakage in the event of accidental spills. Each Securall safety cabinet comes standard with two 2” Vent Openings in interior and exterior walls, with flash arrester and bung plugs for optional venting. Each Securall cabinet is outfitted with FM required Non-Sparking, 3-Point, Self-Latching door(s) for safe and complete closure every time. Securall Self Closing Cabinet - Self-Closing Mechanism segregated from interior of cabinet and contents stored. Self-Closing cabinets come with Fusible Link Assembly. Link melts at 165 F for automatic closure in case of fire. Self closing mechanism segregated from hazard area..
All Securall cabinets come ready with an FM defined static ground connection, comprised of a NFPA compliant 5/16 - 18 x ½” Zinc Plated Grounding Bolt. 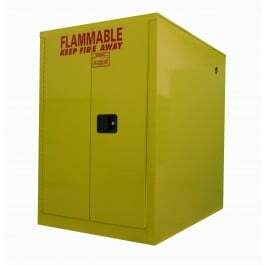 Securall cabinets have a Large Warning Label to identify the type of material stored within the unit. Also available in French and Spanish. Securall cabinets are equipped with four adjustable Zinc Plated Leveling Legs for placement on uneven surface areas. All Securall safety cabinets come standard with a Flush Mounted Locking Handle for smooth finger-tip operation. Securall double-wall doors are secured to unit on full length, Heavy-Duty Piano Hinges for maximum security and limited vapor release. Safe, convenient and centralized storage for Flammables. Vertical Drum Cabinets have ball bearing rollers for easy placing and removal of 55 gallon drums. From one to twelve 5-gallon safety cans can also be stored depending on the model. Horizontal Cabinets store one 55 gallon drum and one 5 gallon safety can. Drum cradles available. Horizontal cabinets have tracks to guide Drum Cradle into position. Choose from 3 door styles.